The Somero CopperHead Laser Screed helped revolutionize the entire process of concrete placement. 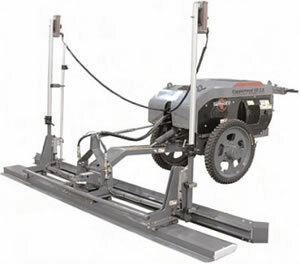 The CopperHead is a smaller machine that can reach places that the "big screeds" cannot! The CopperHead is the first Laser Screed able to work above grade in applications such as steel frame / composite decks and pre-cast deck panels with toppings. 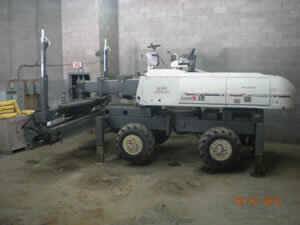 The CopperHead can place concrete more efficiently and more accurately than any other current placement methods. In some cases, the CopperHead is even better for jobs than using a large Laser Screed. Plus, we can screed 4000 square feet per hour and get excellent "F" numbers despite demanding conditions. FL numbers are improved by up to 20%. 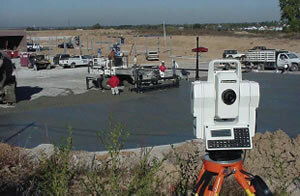 The Quartz Laser control system offers improved elevation control for a smoother flatter surface. Rotating head allows easy movement around columns and other obstructions. Lower noise levels on the job site. Lower profile for better operator visibility, improved sightlines, and safer operation. Screed 5,000 square feet or more per hour.